EMC Planning Group has prepared a Specific Plan that amends the San Benito County General Plan, integrates with the Gavilan College Proposed San Benito Campus, and provides the land use planning and regulatory guidance for the Fairview Corners, LLC planned residential community. 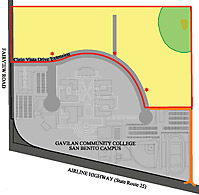 The Fairview Corners Residential Community is located adjacent to the proposed Gavilan College San Benito Campus, directly north of Airline Highway (State Route 25) and east of Fairview Road, in an unincorporated area of San Benito County southeast of the City of Hollister. The Fairview Corners Residential Specific Plan provides the land use planning and regulatory guidance for a diverse community with a variety of lot sizes and housing choices, including roadway and utilities infrastructure, parks and open space buffers. A maximum of 220 lots and/or principal dwelling units, excluding secondary dwelling units consistent with the zoning standards set forth by the Specific Plan, to be constructed in two segments and up to eight phases, would be allowed in the Plan Area. EMC Planning Group provided overall Master Planning project oversight, coordination, and management for both the proposed 60-acre Fairview Corners, LLC residential community and the adjacent 78-acre Gavilan San Benito Campus (approximately 138 acres). These proposed projects have shared roadways, open space, and project infrastructure. The coordinated land planning efforts included design and process input, review of the Gavilan San Benito Campus and Fairview Corners Projects EIR (DJP&A 2008), comments and response to comments to the EIR including review of associated technical reports, review and input on findings necessary to certify the EIR and approve requested entitlements by the Gavilan College District Board. EMC Planning Group’s land planning and entitlement processing efforts for the planned residential community have also included preparation of San Benito County project application materials (Preliminary Allocation, General Plan Amendment and Rezone). In conjunction, EMC Planning Group has prepared a project specific EIR for the 60-acre Fairview Corners Residential Specific Plan. Environmental issues addressed in the EIR include the loss of upland habitat for the California tiger salamander, visual impacts, cultural resources, water availability, air quality and climate change, geologic hazards (on-site fault zone), sewer service, surface water run-off, noise, and traffic. Copyright © 2019 EMC Planning Group Inc.